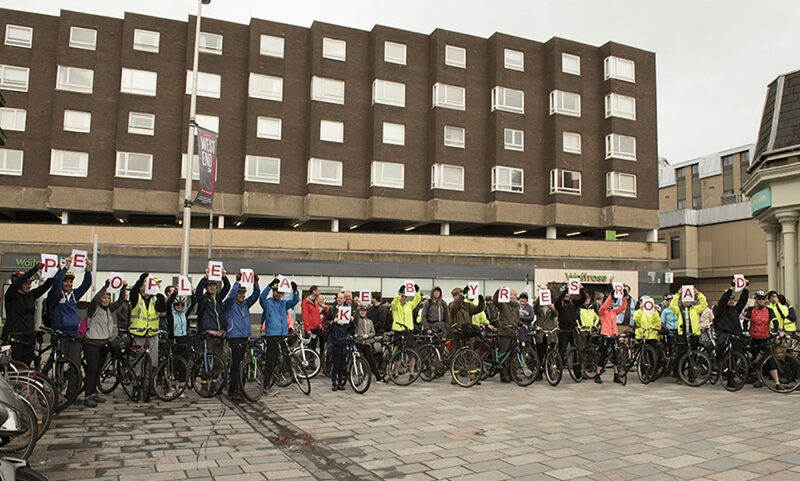 We are close to the closing date of the Restricted Roads (20 mph Speed Limit) Bill Survey, and while we have no new formal consultations, we do have news of yet another stage of the South City Way and other positive news for cycling in Glasgow. Do read on …. Nothing new has come in as yet in January, but Digest 25 has all the details of open consultations and we will also list them here – please check and respond on those that are important to you. GoBike has responded to this proposal with this letter of support. Please feel welcome to use the detail within our letter to also voice your support for this active travel improvement to East Dunbartonshire Council. This is a particularly important consultation, with a very quick survey to respond to so please take a minute to look at the survey and write to your MSP, particularly if they are involved in the progress of this Bill. See our post that came out late on Sunday evening for detail. Here’s the letter we have sent to all members of the Rural Economy and Connectivity Committee and we also have a template letter to help you along with Sunday’s post. Again, see Digest 25 (Item 1.4) for all the details. Here’s the letter of support that GoBike has sent in, although we have expressed our view that we should aim for standard provision to be unidirectional cycle lanes, and not the bidirectional lane proposed for this section of the South City Way. Do please write in to support this – there may be opposition to some of the restrictions on motor traffic. This was item 1.5 in Digest 25 and GoBike will be writing in before the deadline to support these proposals to slow traffic down on this busy road near Westerton Station and in the surrounding residential area. There will be a gap of 0.75m of a gap between each speed hump and the kerb; we might just ask for this to be increased to 1.2m to ensure smooth passage for bikes (and trikes). We will be responding to this, Item 1.6 in Digest 25 within the next two weeks, so our response will be in the next digest, due out on 05 February. We have someone working on our response to these proposals, Item 1.7 in Digest 25 and we’ll be publishing it in our next digest. It’s high level stuff but we do need to ensure it sets us on the right path. Item 8 in Digest 25 and we are developing our response, but also see Item 2.1 below for news of a meeting this Thursday 24th January. Two GoBike members are meeting with East Dunbartonshire staff on Thursday to discuss the Local Development Plan. There will be a report back in the next digest. We have received this tweet from Councillor Anna Richardson. No sooner is Glasgow City Council consulting on the Gorbals Street section of the South City Way and the next phase comes along. It looks as if the route might continue as bidirectional but do get along to the Briggait to see the proposals in detail. The proposals for Battlefield are taking shape and the two options for joining Battlefield Rest to one of the sides of the triangle around it and the two options for the cycle lanes all the way from Holmlea Road in the south to Victoria Road in the north will be presented. Will it be two unidirectional lanes, which is GoBike’s preferred choice or one bidirectional lane? Get yourself along to Langside Library on 19 March, afternoon and early evening to voice your view. The second meeting of the Battlefield Design Group met on Tuesday 08 January. GoBike was represented by Tricia and Eachann, who, as a GoBike member and local resident, will now be taking the lead for us on Battlefield. Other interests were represented by SPT, the local Community Council and Sanctuary Homes who are developing the old hospital site. The discussion centred around joining the Battlefield Rest island to either the old hospital site on the west, Battlefield on the south or, the least favoured option, which was discarded at the meeting, to the new hospital site on the east. The second point of discussion was whether cycle provision should be by two unidirectional lanes or one bidirectional lane. The unidirectional lanes option is preferred by GoBike and the other attendees who cycle and one bidirectional lane is preferred by those who favour the retention of more on-street car parking. What will the final choice be? Get along to Langside Library on 19 March to state your view and then remember to partake in the final consultation. That’s it for now, back with you early in February. Wrap up warm when you are out and about.